Too often, the elderly live forgotten in depressing conditions. The mind of a five-year-old might be exactly what elder care needs. What about a facility designed by Disney? It's just one of the creative solutions popping up around the world, proving that engaging, personalized environments improve quality of life, health and longevity for seniors. Recently, we visited our Aunt Pat at her seniors' home to celebrate her 80th birthday. Marc's five-year-old Lily-Rose had seen the tiny rooms and lonely seniors there before, and this time insisted we bring a box of teddy bears. Residents were thrilled -- it was just what the doctor ordered. 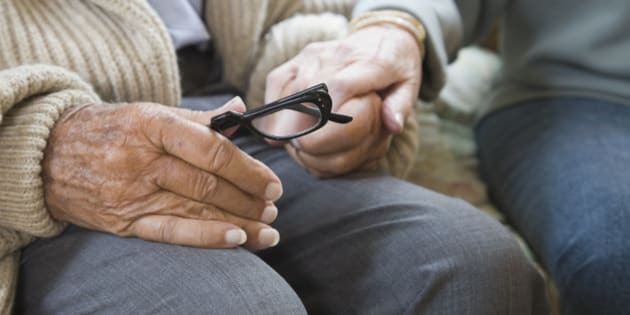 Living conditions are especially important for more than half a million elderly Canadians with dementia, a term for any chronic disorder, such as Alzheimer's, that impairs memory, reasoning and cognitive function. As dementia takes its toll, patients become far more sensitive to their environment. Unfamiliar settings increase anxiety and stress, leading to agitation and even violent outbursts which are treated with drugs and physical restraint. As many as half of seniors with Alzheimer's die within a year of being admitted to standard long-term care facilities. Studies have found that the sudden disruption in routine, a lack of activity and socialization leads to depression, and lessens the will to live. Various health care models around the world are finding ways to break out of those statistics, building facilities that preserve routine, daily activities and social integration to keep seniors healthy longer. Hogewey, on the outskirts of Amsterdam, is a village whose 152 residents are all dementia patients. Founded in 2009 the 'town' has a cinema, restaurant, hair salon and stores. Under the discretely watchful eye of staff, residents go about their business, dining, shopping and socializing. Hogewey staff report their residents require fewer medications and live longer than those in standard assisted living facilities. Hogewey is one of the inspirations behind Aegis Living--a privately-owned assisted living company in Seattle. Founder Dwayne Clark has spent 30 years working in assisted living and studying seniors' care in Canada, the US and Europe. Clark hired designers from Disney Imagineering to create an indoor neighbourhood with classical Queen Anne architecture. A boardwalk featuring stores, a juice bar and a theatre simulates the streets where his Seattle residents grew up. Hogeway was partly funded by the Dutch government, while Aegis Living is privately-owned. Canada's senior care model is a mix of public and private. But we can learn from the creativity these models demonstrate, with adaptations to make them affordable and accessible for all. Recreating familiar environments presents a challenge in Canada's multi-cultural society. Urban centres like Vancouver and Toronto offer culturally-sensitive care facilities for Chinese and south Asian seniors. Speaking their first language and eating the foods they grew up with creates a safe space and prevents feelings of isolation of these ethnic groups. These facilities are so in-demand (and so few and far between) that waiting lists can be up to six years long. Teddy bears may not be practical, and the minds behind Mickey Mouse may not be affordable for our health care system. But Canada needs more imagination when it comes to caring for our beloved aunts, uncles, parents and grandparents.